Akrotiri was initially inhabited in 4500 B.C., while during 17th-20th B.C. centuries it became an important economic, cultural center and port in Aegean Sea, with commercial relationships to central Greece, Crete, Cyprus, Egypt and Syria. In 17th B.C. it was heavily damaged by an earthquake, but it was soon rebuilt and developed, until 1600 B.C. when one of the biggest volcano eruptions in earths’ history buried the whole city. The dust that covered the buildings contributed to their reservation in an excellent condition until the excavations of 19th-20th centuries which revealed an area of 200.000 sq.m. with impressive 2-3 floor buildings, sewage system, colorful wall paintings, ceramic pots and furniture. This has been one of the most important excavations in the whole world. 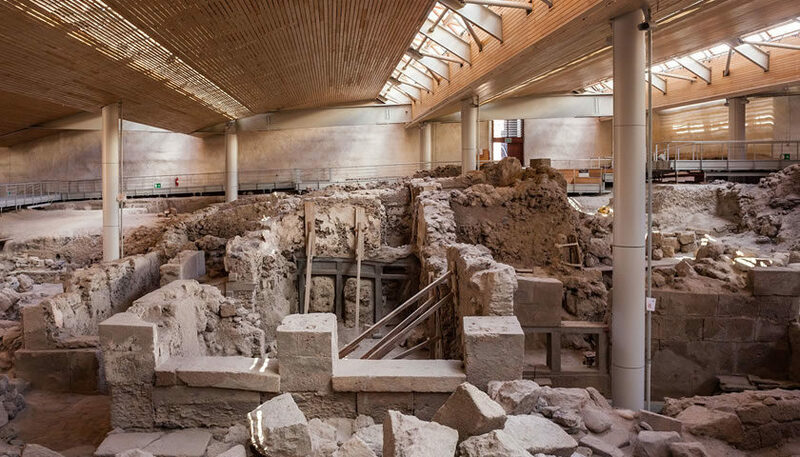 You can visit the excavations of Akrotiri and learn more about the prehistoric town of Akrotiri. The ticket price is €12 (reduced ticket €6), while there is free admission for students of EU member states and persons up to the age of 18. 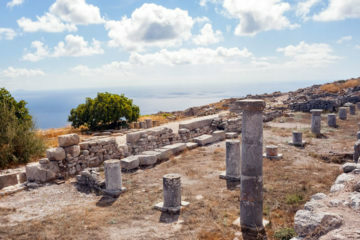 It is worth buying a 4 day ticket that costs €14 (reduced €7) and allows the entrance in Prehistoric Town of Akrotiti, Ancient Thira, Archaeological Museum, Museum of Prehistoric Thira and Pyrgos’ Icons and Relics Collection. The city of Ancient Thira, built on mountain Mesa Vouno between Perissa and Kamari, was established in 8th century B.C….